You can save both time and money on airport parking at Baltimore-Washington International Airport (airport code BWI). There are ten different Baltimore airport parking choices so it makes sense to compare prices. “PreFlight Airport Parking” and “Park ‘N FlyEconopark Express” also has an additional valet park option. “ValetPark Express” is valet-only. Baltimore Washington Airport is located, fittingly, along Baltimore-Washington Parkway and serves an area even outside the city of Baltimore or Washington, D.C.
A low-cost carrier outlet, almost half of BWI’s traffic flies on Southwest Airlines. The two largest international airline carriers are British Airways and Icelandair. The full name of BWI is actually Baltimore-Washington International Thurgood Marshall Airport: quite a mouthful! Thankfully, it is most commonly referred to by its airport code – BWI. WiFi is available at a number of airport locations, with the option to rent a wireless card if your computer is not wireless enabled. Telephone vending machines are located throughout the airport. A 5,000 square foot USO International Gateway Lounge services men and women in the military and their dependents. For up-to-date traffic information, check out Maryland CHART here. Taxi: A number of taxis service BWI from both Washington, D.C. and Baltimore. Rail: BWI rail stops one mile from the airport. A shuttle bus transports passengers to and from the airport. It is approximately 35 minutes from Washington, D.C. and costs $6 to travel during the week on MARC Penn Line. Weekend warriors are forced to take the much more pricey Amtrak. From Baltimore, tickets are $4 on the MARC during the week, taking about 10 minutes from Penn Station. The Light Rail costs $1.60 and arrives near the international airport terminal. 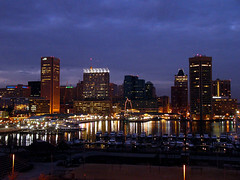 A trip from downtown Baltimore is approximately 25 minutes. Bus/Shuttle: Shuttle buses travel from Ronald Reagan Washington National Airport and Washington Metrorail. Planning a long drive to or from the airport, or an odd-hours flight? Check out Baltimore Airport (BWI) park and sleep hotels. Don’t fancy driving to the airport? Or leaving your car there and paying for parking? Catch a shuttle to Baltimore airport.